I thoroughly enjoyed DJ Hero and I was saddened to hear that the game didn’t sell as well as they hoped it would. Thankfully, they released a sequel and listened to some of the criticisms from the gamers this time around. I’m also happy to get more use out of my plastic turntable (which is required for playing the title). If you missed out on the turntable from the last game, you can still buy DJ Hero 2 with or without it. I have seen sales for as low as $50 for the whole bundle! When you first launch the game you’ll be prompted to select your DJ and a symbol to represent you in all the game\'s modes. The main single player mode is called Empire where you must play gigs around the world and defeat some big name DJ’s along the way. As you play songs in Empire mode, you’ll unlock them for Quick Play mode. When you defeat a DJ, you’ll make them available for online matches. To spread out your empire, you\'ll be traveling around the world showing Europe, Japan, and the US how to party. You\'ll also be facing off against well known DJ\'s including Tiesto, DJ Qbert and Deadmau5. If you defeat them, they will become playable in online battles and quick play modes. You can also score some outfits, headphones and power decks to give you an extra edge. 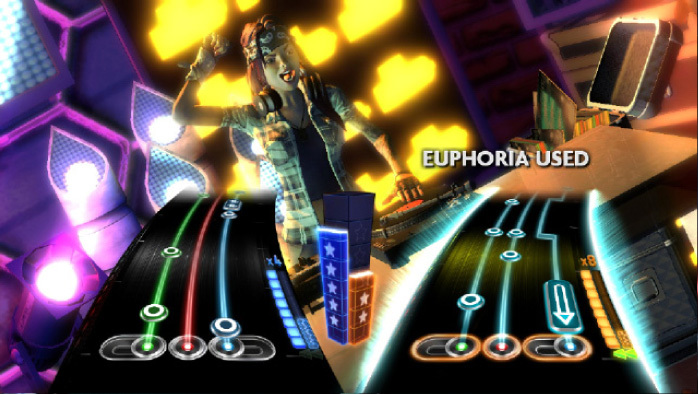 Some turntables you unlock will give you point bonuses with taps, scratches or an extended euphoria mode. My only complaint with the single player campaign is that you\'re stuck playing 20-minute mixes. You can\'t pick individual songs to play or improve your score on. Just like DJ Hero, the sequel is all about the stars baby! The better you play, the more stars you can earn, with a maximum of five per song. As you accumulate stars, you will unlock new venues, songs, and bonus tracks. There are unlock codes available so you can unlock gigs regardless of how many stars you have. While you can\'t fail a song like in other music games, playing poorly gives you very little of the incentives above. Strong Points: Slicker Interface; DJ Battles add a nice touch; more room for song personalization. Weak Points: While the track list is decent I liked the DJ Hero set list better. Moral Warnings: While most of the swearing is removed, some songs still have the D word; The sexual references are still intact. 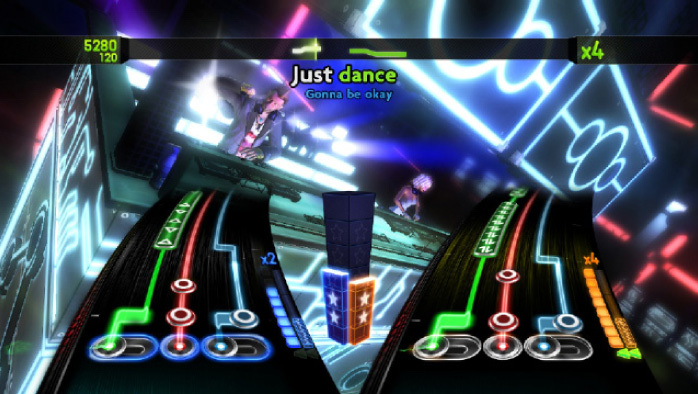 The gameplay consists of pressing the turntable buttons at the right moment when the notes on-screen line up. Proper timing means your score will multiply, which then grants you up to five stars when the song finishes. Messing up or missing a crucial prompt will bring your score multiplier back to one and omit the music that would\'ve played which isn\'t a good thing considering how fun the setlist is. When it comes to scratching (pressing the turntable in one direction which produces a scratch sound), you\'ll have to scratch for the entire duration of what\'s shown, if you stop too soon or go too long, you\'ll get penalized. The harder difficulties specify which direction you have to scratch, whereas easier songs only have one direction. Crossfading the songs to make them mesh together can get tricky at times, too. Fortunately, with euphoria enabled, it can do the crossfading for you. When you do well on glowing song segments, euphoria becomes available and is triggered by pressing the blinking red button on the turntable. The whole purpose of this game is to make two or more songs mesh together. If you fade in or out too early, you\'ll hear it cut out. If you push a button at the wrong time, you\'ll hear static and music lacking a proper beat. All the hard work of matching the beats per minute, has been done for you. All that\'s left to do is keeping the beat and mixing the songs together. While I enjoyed many of these songs, I enjoyed the songs in the previous DJ Hero much more. I\'m not that big into rap or hip hop. Multiplayer can be played locally with another turntable, or online. I had no problem finding opponents to play against online over PSN. There are a few different modes you can compete in which can earn points for playing people and unlocking various achievements. There is a check point mode where whoever does better in the song section gets awarded a point and the player with the most points wins. There’s another mode that determines the winner by whoever has the higher combo. The single player boss battles use the checkpoint system so that\'s the one I\'m the most familiar with. The controller itself hasn\'t changed since the first DJ Hero and is still nice and sturdy. I found it easy to use and customize, and it\'s configurable for both left and right-handed players. The game itself can even change the button order in-game to match your set-up. The controller was relatively comfortable to use but after playing many sets my thumbs would be tired from scratching the turntable. I was most comfortable playing this game using a tray table. The music set list is very impressive with over eighty custom mixes for the game. There is downloadable content available for purchase from six to eight bucks. My Coke Rewards is currently offering a Tiesto pack for free, and if you have DLC from DJ Hero, you can import it over. The mixes are done by many prominent mixers such as DJ Jazzy Jeff, Tiesto, David Guetta, Deadmou5 and DJ Qbert. Many of the mixes have rap and some of them have a rock sound to them. The songs are often a combination of two songs and some of the mixes have three or more songs combined, some sampling either obscure or big name tracks. Some of my favorite songs in the game would be: Kanye West\'s "Love Lockdown" mixed with Metallica\'s "The Day That Never Comes", "California Love Remix", Kanye West\'s "Heartless" mixed with Lady Gaga\'s "Lovegame", and Tweet ft. Missy Elliott\'s "Oops (Oh My)" mixed with Snoop Dogg\'s "Who Am I (What\'s My Name)". There\'s a wide array of fun and unique mixes, feel free to Google the entire list, or check out some videos to see and hear the game in action. As I mentioned earlier all the tracks are pre-mixed, but there is room to add your own personal touch. When the red stream is widened, you can press the red button and insert sound effects of your choice. A new addition to DJ Hero 2 is that you can now personalize some crossfading sections. The tutorials go over the game’s changes and even mention the ability to sing along if you like. Some of the songs have lyrics that I would prefer not to sing though. As you can guess, there are some appropriateness issues in a number of the songs. I doubt the lyrics “she licked me like a lollipop” is talking about candy. There is also some swearing including the D-word. Other issues worth noting are some tight and revealing clothes on some of the female DJ’s and audience members. Surprisingly, I didn\'t see any poles! The graphics are exceptional and the interface has improved overall, but some of the DJ avatars are just plain weird looking due to the stylization. The recognizable DJ’s look pretty accurate; my favorites include Deadmou5 and Tiesto. The venues have a lot of lights, effects, and a detailed dance floor. The character animations look spot on and believable. 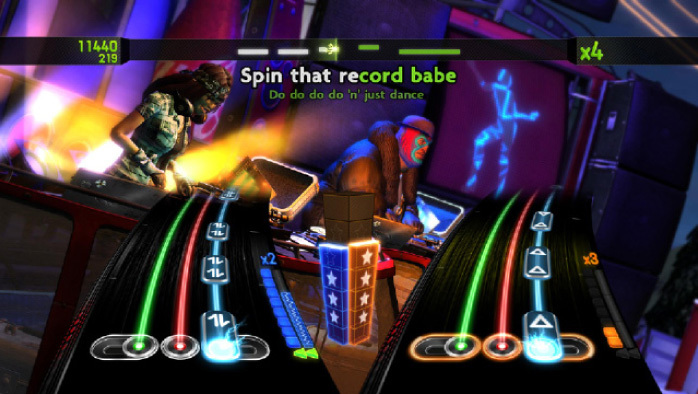 With the wide variety of songs, downloadable content, various difficulties, and online play, there is plenty of fun to be had with DJ Hero 2. Like many music games, there are some questionable songs. Unfortunately, the single-player campaign does not let you skip songs. You can pick and choose your sets in the quick play mode provided you unlocked the songs you like. Although the song list is decent, it’s a bit too hip-hop heavy for my tastes. While the interface tweaks are nice, I\'m still a fan of the original game. If you like the songs, and online play, DJ Hero 2 is a worth while purchase.